Sometimes little things are what makes a difference. Sometimes it can feel that life is throwing you a tidbit, that it knows that something so insignificant can make you happier. Today that’s what it feels like, anyway. 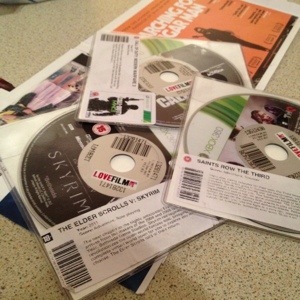 I rent movies and games through a site called LoveFilm. It is primarily there to rent DVDs and stream them online. But I use it to rent games. I don’t buy a lot of games, because I am so awful. I don’t have the patience to play a game for hours and hours. I get bored. So I get 2 or 3 games at a time, and can send them back when done. It’s simple, and I think it’s a worthy distraction from my current life. Lose myself in a game, and forget what is happening. That’s why movies, music, books and games are so popular, in my opinion, because they provide a distraction. And distraction, is sometimes all we need. This entry was posted in Life and tagged distraction, games, life. Bookmark the permalink.